I. Pierre Perrine, b. in Lower Chalfont, France, d. NY. fled from persecution that followed revocation of Edict of Nantes in 1685 by Louis 14th & went west to Netherlands, then to America. Found passage on ship “Caldonia,” which wrecked on the SE shore of Staten Is., NY where he made his home. A. Daniel Perrine, aka “The Huguenot” (1642- post-9/6/1719) b. Isle of Jersey, Channel Is., France, d. Staten Is., Richmond Co., NY. One of 18 servants who came on ship “Philip” by Gov. Philip Carterat, (NJ 1st Gov.) landing in NY 7/29/1665, m. twice, 1st – 2/18/1666, Elizabethtown, NJ, Maria Thorel (ca. 1640-ca.1686) (also servant of Gov. Carterat) This was the 1st marriage in New Caeseria (NJ) They were members of the group or colony of 35 who came with the Gov. from Elizabethtown in 1665. occ. yeoman, bought land 3/12/1687, of Paul Richards at Sinoakin Pt., 6 ch., 2nd – ca. 1688, NJ, Elizabeth ---, c. post-9/6/1719, Staten Is., Richmond Co., NY, 2 ch. b) Andrew Perrine (5/1/1763-12/11/1813) Cranbury, Middlesex Co., NJ, m. twice, 1st - 6/5/1785, NJ, Elizabeth Morford (1/26/1762-6/20/1790) 3 ch., 2nd – ca. 1786, Cranbury, Middlesex Co., NJ, Mary Mount, (11/7/1772-7/15/1848) b. Cranbury, Middlesex Co., NJ, 9 ch. i) Rebecca Perrine (2/20/1772-1/6/1847) b.& d. Middlesex Co., NJ, m. 1792, NJ, John Dey (8/23/1753-10/11/1815) b. Perth Amboy, Middlesex Co., NJ, d. Middlesex Co., NJ. j) Margaretta Mount Perrine (10/11/1781-1/7/1862) m. 9/18/1800, NJ, James Cook (8/22/1775-5/4/1859) b. Hightstown, Middlesex Co., NJ, served in Rev. War as Maj.
o) William Williamson Perrine (12/31/1793-10/21/1879) m. Sarah Voorhees, moved to Philadelphia, PA, then Somerville, NJ where he d., they had 2 daus. (b) J. Frank Dye (Dey) (1850-1910) m. twice, 1st - Virginia Boyd, d. 1891, 7 ch., 2nd – Cora Van Duzen, 1 ch. 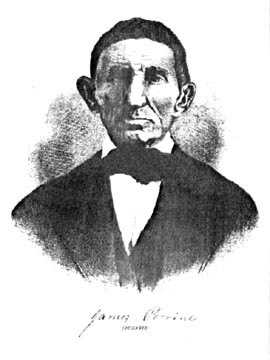 b) James Perrine (9/6/1786-4/11/1872) b. NJ, at 6 moved to KY with family where he res. til 25. In spring 1812, moved to OH settling in Union Twp., Warren Co., OH. occ. farmer, politically started as Old-Line Whig, then Repub. and during Civil War staunchly supported the North, a man of high integrity and highly respected, m. twice, 1st – 8/27/1807, Ann Applegate (5/17/1790-10/1/1823) at the time of his death among the oldest res. settlers of Warren Co., OH., 5 ch., 2nd – Elizabeth Davis, d. 1/6/1863, 11 ch.. He is said to have shot the last deer killed along Muddy Creek an old buck shot in 1814. 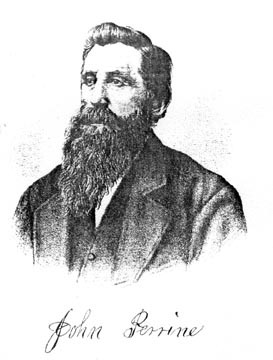 (a) George Keever, served under Capt. Williams , 12th OH Vol. Inf. & as orderly sgt. in 35th OH Vol. Inf, Co. A, under Capt. Budd. At Battle of Chickamauga was k. on skirmish-line early on 1st day of fight, bur. near battlefield. ii) Daniel J. Perrine, b. 10/9/1811, m. Eliza Murphy, 5 ch. (3 d. in 1882) & 2 g’ch. (a) David S. Perrine enlisted 79th OH Vol. Inf , k. Peach Tree Creek, Chattanooga, TN, bur. Nat. Cem. there. (b) dau. Perrine, m. David Morris enlisted 79th OH Vol. Inf. with David S.
vi) Lydia E. Perrine, b. 6/3/1820, m. Joseph Lamb, res. Mason Co., KY, 8 ch. (4 d. 1882) 7 g’ch. vii) Elizabeth Ann Perrine, b. 3/12/1825, m. George W. Probasco, d. 1865, 3 ch. x) Joseph C. Perrine (12/10/1830-7/3/1864) enlisted 8/20/1861, Co. A, 35th OH Vol. Inf. d. at Chattanooga, bur. Nat. Cem. there. (a) Harriet Perrine (8/14/1835-1/10/1880) d. Kirksville, Adair Co., MO, m. 6/1/1851, Mercer Co., PA, John Vaughn (4/11/1825-9/11/1905) b. Mercer Co., PA, d. Kirksville, Adair Co., MO, military service in Civil War, Co. F, 199th PA Inf. (c) Sarah J. Perrine (1840-1920) b. NY, d. Mercer Co., PA, m. Julius Boyd (4/1/1837-1917) b. New Vernon Twp., Mercer Co., PA, d. Mercer Co., PA, served in Civil War, Co. F, 199th PA Vol. f) Henry Perrine (6/5/1767-3/1793) b. & d. Staten Is., Richmond Co., NY, occ. weaver, will 10/29/1792, proved 5/2/1793, speaks of brothers David, Cornelius & Edward, no wife or ch.